Around 100 people, at the behest of the Chinese embassy in South Africa, staged a protest at the University of Stellenbosch while CTA President Dr Lobsang Sangay was addressing the students and faculty of the University’s law department on 8 February 2018. The protesters comprised of both South Africans as well as Chinese. The protesters were seen raising slogans such as ‘One China’ and ‘Stop Splitting Tibet from China’ and carrying banners such as ‘One China Policy ’, in what seemed like a glaring case of being oblivious to the core issue of the Tibetan struggle. His Holiness the Dalai Lama and the Central Tibetan Administration have long renounced complete independence for Tibet. They have proposed the Middle Way Approach, which seeks genuine autonomy for Tibet maintaining the ‘one China policy’ that the protesters themselves were calling for in their protest in Cape Town. This was a clear indication that many do not understand the issues facing Tibetans and remain one sided in their approach. For democratic South Africa where freedom of speech is valued this approach is tantamount to apartheid South Africa, a blinkered perspective from propagandist information. While addressing the students, Dr Sangay reminisced having listened to Cyril Ramaphosa speak at Harvard Law School and being told that South Africa has one of the most progressive constitutions and that it ensures equality and freedom. But lamented that currently it looks as though a watering down of the constitution and its values is taking place. “I’ve walked the same path as South Africa has walked and it’s the same message I want to communicate: to embrace the values of the constitution. You must all embrace it and uphold it. 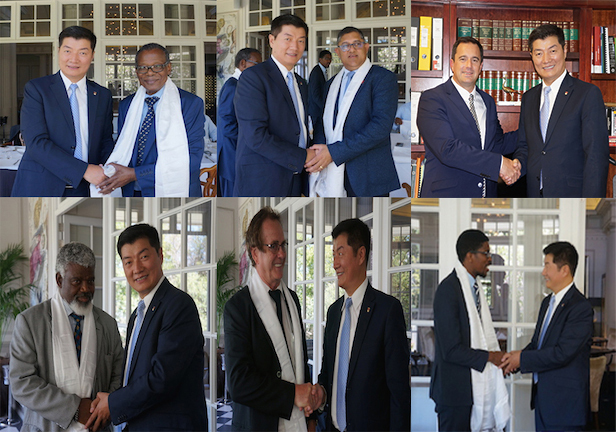 If South Africa could achieve success, so can achieve it in Tibet, without violence,” Dr Sangay said. He said, “The University especially the law school stood up for freedom of speech and the values enshrined in the South African constitution. It’s admirable that there are people who’ll continue to uphold the spirit of democracy and human rights,” he said. The Inkatha Freedom Party condemned the South African Chinese embassy’s actions in response to CTA President Dr Lobsang Sangay visit to the country. In its press release it expressed its outrage at the lengths the Chinese government will go to in order to silence the voice of the Tibetan people in South Africa.